It’s been done with the US (map, list), Brazil and China, but I wanted to do this slightly differently. Before there was the EU, there was the European Community. Before the EC, there was the European Coal and Steel Community. And before that, there was the BeNeLux Customs Union, dating from as far back as the second world war. It was quite a logical grouping, however, because until 1890, these three countries, in one form or the other, were the United Kingdom of the Netherlands, when the reigning king died and was succeeded by a woman, which was considered unconstitutional in Luxemburg, which resulted in Luxemburg breaking away. Economic and social ties between the three countries are still rather strong, particularly between Belgium and the Netherlands. But all three countries are tiny. The Netherlands, with some 16.5 million inhabitants is the largest, followed by Belgium with nearly 11 million and Luxemburg with just half a million. However, economically, notwithstanding the current downturn, all three countries have been prospering for a while, roughly starting at the beginning of the 17th century with the Dutch Golden Age, when the low countries become one of the reigning colonial powers. Basket case Africa (am I ruffling feathers yet?) is of course a very different story. Why exactly Africa has been lapped, several times, since the 1960s, when most African countries gained independence, by the economic developments of the south east Asian countries is no topic of this post, but the fact remains. In fact, the size of the African economy is puny, laughable even, compared to the rest of the world and considering its size. The chart below compares the GDP of the BeNeLux with that of Africa. The GDP of the low countries in 2009 (2008 for the Netherlands) was a grand total of 1403 billion USD. The total estimated GDP of the 34 countries with the highest GDP in Africa was 1401 billion USD. The remaining 18 countries, together, only had an estimated GDP of some 32 billion USD, just over a negligible 2% of the rest and, therefore, only some 2% of the GDP of the BeNeLux. 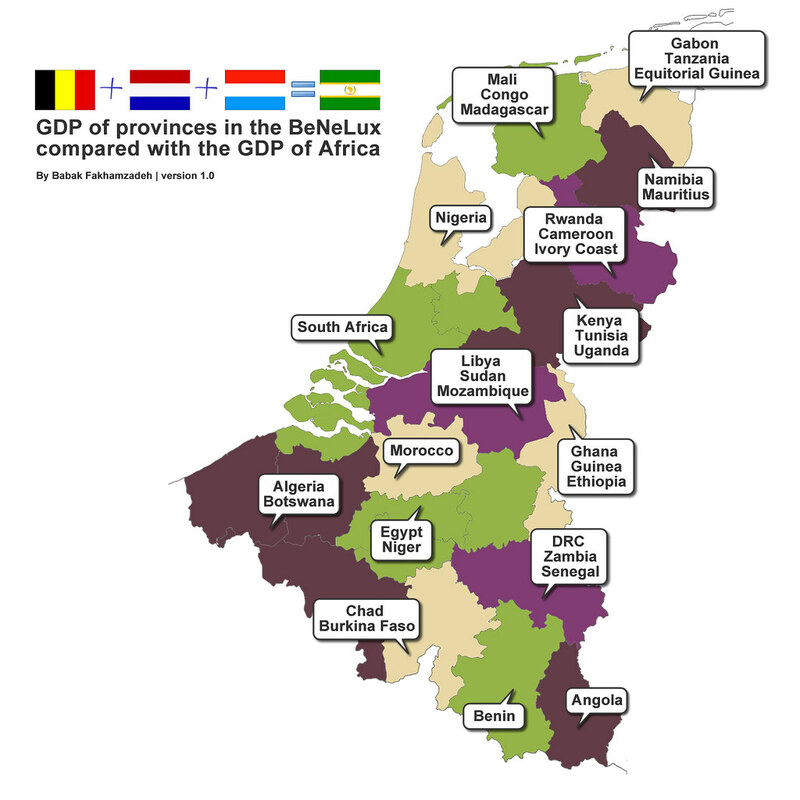 Therefore, it’s very reasonable to say that the GDP of the whole of Africa is practically identical to the GDP of Belgium, the Netherlands and Luxemburg, combined. 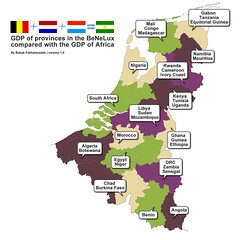 The chart compares the GDP of the provinces of the BeNeLux with the GDPs of African countries. Sometimes, the provinces are grouped together, sometimes the African countries are grouped together. So, with a combined population of about a billion people, Africa creates about as much value as some 27 million people in a tiny corner of the north east of Europe. Note that for exchanging the BeNeLux’ GDP from euros to dollars, I used the exchange rate for the last day of 2009. With the tiny increase in GDP for Holland for 2009 and the fluctuations of the exchange rate during the year, it’s very likely that, at some point, the 2% difference between the GDPs of Africa and the BeNeLux occasionally evaporated, perhaps even making the GDP of these three countries occasionally bigger than the GDP of the whole of Africa.